Gerry Judah has bestowed another form of cars-flying-in-the-sky sculpture unto humanity, this time at the request of Porsche GB. He's well known for this sort of metal aerobics, like a collection of airplanes and their contrails frozen in time – of course fashioned for a decidedly automotive flavor. I dig it. 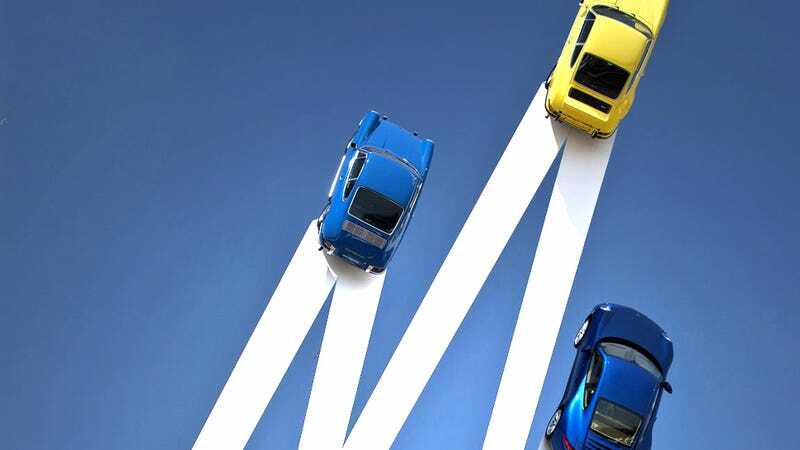 Artist and designer Gerry Judah has created a gravity-defying sculpture that holds three iconic Porsche sports cars 35 metres high in the sky. The sculpture was the centrepiece at the recent Goodwood Festival of Speed in West Sussex, England. Judah was commissioned by Porsche GB to create the sculpture as a celebration of 50 years of the Porsche 911. The sculpture has three futuristic white, steel arrows that race upwards, each with an example of the 911 at its apex. The models incorporated in the sculpture are: the 1963 Original 911; the 1973 911 Carrera RS 2.7; and the 2013 911. "Simple, pure and built for the job." Porsche enthusiasts the world over, rejoice; a sculptor somewhere on this earth understands your plight.